Trainer Nicky Henderson crowned a great week when Bobs Worth came out best in a great Betfred Cheltenham Gold Cup with stablemate Long Run in third. "It has been a long old week, hasn't it? You know that both horses were fighting, both boys gave them great rides and both horses were fighting to the line. It was a great race," said Henderson, who was also celebrating his 50th Festival success. "It's dreams, isn't it? Sprinter Sacre was something special and I am proud off both those horses, both jockeys. Barry (Geraghty) gave Bobs Worth a lovely, patient ride but Sam (Waley-Cohen on Long Run) has done the right thing - jumping the last, he had got them all in a bit of trouble but he didn't quite get up there. But A P (McCoy on runner-up Sir Des Champs) knew he was there, he wasn't intimidated. They have both run fantastic races. "We have to do it at home with the team we have and I want to say thanks mates because they have all been absolutely brilliant. What we go through is never easy and it has its ups and downs but when it happens it's great. "It has been a long wait because we haven't run either horse - Bobs Worth hasn't run since the Hennessy and Long Run since the King George - so it's a long, old time. It's been a long wait, it has been a lot of work . I know Shane, who rides him everyday, was very confident with the horse but I was worried about the rain. "He is such an honest horse and a thorough professional that loves what he does. He loves coming up that hill. It looked that he was in a bit of trouble coming down it but, in fairness, he always gallops up it. Barry just let him creep into it. 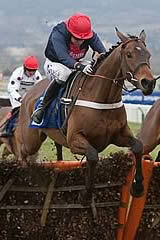 "There is only three weeks until Aintree so I am not sure Bobs Worth would go there. We'll see how he is next week and I wouldn't completely rule it out. There is also Punchestown but we'll just see how he is, he may not run again this season. But Long Run could easily run again and could go to Aintree. "I didn't want to run him on the really soft ground here in January because it would take a lot out of him so that might be the case here. "It's my 50th Festival winner. If you had asked me 50 years ago about it, you would say that it was absolutely ridiculous." Malcolm Kimmins, who heads the Not Afraid Partnership which owns Bobs Worth, added: "This is the best feeling in the world bar none. He ran a cracking race and was so brave." Barry Geraghty's long association with Bobs Worth peaked with triumph in steeplechasing's most important race, the Betfred Cheltenham Gold Cup, but the moment was tinged with a sad note. Geraghty and his brother bought Bobs Worth as a yearling for €16,500 and sold him to trainer Nicky Henderson as a four-year-old for £20,000, but the winning jockey was quick to dedicate today's win to injured amateur J T McNamara, whose neck injury sustained at The Festival yesterday has clearly rocked the jockeys' weighing room. Reflecting on the race, Geraghty, whose mount won by seven lengths and two and three-quarter lengths from Sir Des Champs and Long Run, said: "He just struggled on the soft ground for most of the way. After a mile I knew he wasn't happy so I started trying to conserve his energy and save a bit, save a bit. From there I took my time and just chased him along quietly. "I thought I was beaten with five or six to jump, but he ran on down the hill and jumped the third-last well and from there I just held him together. He's not over-big and ideally he wants better ground, because it was hard for him. "He sold them all a dummy today, because he didn't travel well, but I knew if I needed it there was a good bit in reserve. He showed a lot of pace when he worked last week at Kempton, which was a reminder of what he can do, and I knew I had to delay my challenge and not be in a big panic. "It's been nice to have been involved with him from such a young age, but we'll enjoy this for now and not worry about the future. Nicky never minced any words, but he said after the Hennessy Gold Cup [in November] that he would have him fit for the [Betfred] Gold Cup. "I just wish it were a happier day, because we're all very upset about John Thomas. You have to put it out of mind when you're racing, but even though this is one of the biggest days of my career all I could think about was John Thomas. He's a friend of ours and I hope and pray he will be okay." Trainer Willie Mullins was very happy despite 4/1 shot Sir Des Champs losing his unbeaten record at The Festival after finishing second in the Betfred Cheltenham Gold Cup. "He's run a grand race considering I didn't think he was too happy throughout," said Mullins. "He didn't appear to travel at any stage during the race. Tony was niggling all of the time. We were very happy with the run though - we had every chance turning for home but got outstayed I think in the end. "I would have rather it didn't rain but you can't change these things. I would like to come back on a better ground Festival though - we will definitely come back for another go." Sam Waley-Cohen was downbeat despite finishing third on 7/2 second-favourite Long Run. "He's run his race but I was a little disappointed in him as he didn't seem to concentrate early on. "I think he was looking at the film car because I had to slap him down the neck and say 'come on there is a fence'. When he was long he pinged them but when he is in close, he doesn't really help you." "I thought the cheek pieces might help him concentrate a bit more but I'm not sure they worked as well as we thought they could." Owner Robert Waley-Cohen thought his son gave Long Run a perfect ride and was very proud of both jockey and horse. "It's very hard to win here and I thought the horse ran really well. It's very difficult to try and make all but I thought Sam got the tactics spot on. "If he'd have gone too fast then we'd have set the race up for someone else and if we'd gone too slow then it wouldn't have suited him at all." Trainer David Bridgwater was delighted after The Giant Bolster finished fourth and offered no excuses after his horse could not improve on last year's performance when he filled the runner-up berth. "I'm chuffed to bits. We've finished second last year and now we're fourth this year so we can't complain. I don't think the soft ground has helped him but it's probably beaten the rest as well so there's no excuses. "There are plenty more races in him and he'll be coming back again next year with any luck. You never know, his chance may just come one year if he keeps running like that." Jockey Tom Scudamore definitely thought the ground was to blame for The Giant Bolster's defeat. "He's got very tired in the end and the ground was definitely too soft for him. Two out, I thought we had a chance of finishing in the frame at least but he just couldn't quite keep his effort up. He's jumped brilliantly though and given me another great ride."